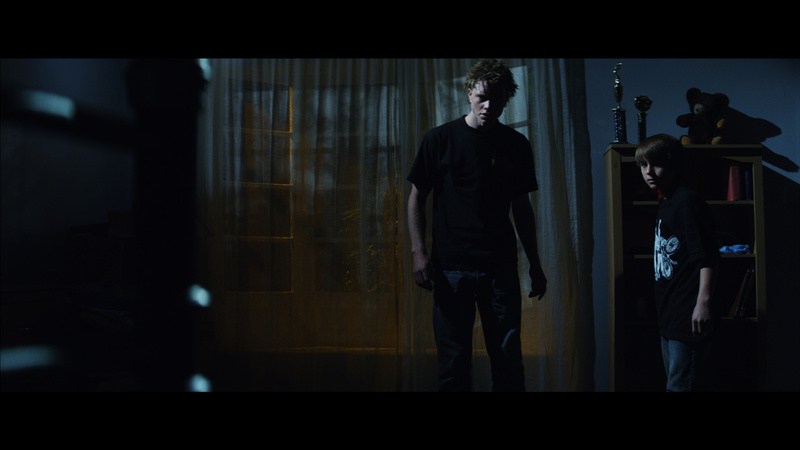 Directed by Steven C. Miller, whose Aggression Scale I have heard rumblings of but have yet to check out, and produced by Brad Miska, Mr. Disgusting from the all-things-horror website Bloody Disgusting, Under the Bed was introduced at Fantasia as inspired by 80’s horror and adventure movies. While wearing a Goonies T-shirt, Miller told the audience that horror from the 80’s has been extremely influential on his career as a filmmaker and Under the Bed was his attempt to make a horror movie that no one seems to be making anymore. Imaginative kids, incredulous parents, bike riding, practical effects, and a focus on atmosphere, Under the Bed is a love letter to 80’s horror and adventure movies that has some character and logic issues, but deserves your attention for what it does well. Neal (Weston) is returning home for the first time after a two-year absence, but he doesn’t seem that thrilled and neither do his neighbors. Something horrible happened to cause Neal to be sent away and while we don’t know the exact details, it appears to have involved his mother and his old home, as both are now missing from his life. Shortly after pulling in the driveway with his father (Holden), Neal is surprised by a small gathering in the backyard of his new home, a ‘Welcome Back Neal’ party put together by his father’s new partner, Angela (Vander). Neal quickly puts the party in the back of his mind as he gazes up to the second floor of the house. His brother Paulie (Griffith) is somewhere up there, and he hasn’t seen him in two long years. Apprehensively, Neal makes his way to Paulie, who at first doesn’t seem to trust Neal. This distrust lasts only a moment and the boys quickly embrace. However, the happy reunion lasts only a moment as Paulie reveals that he is witnessing sinister happenings in the house. The descriptions provided by Paulie match the experiences of Neal and the boys must face a terrifying conclusion. Either they are both losing their marbles or there is a malevolent presence in the house which parents just won’t understand. From start to finish Under the Bed seems to channel the spirit of 80’s horror and adventure movies. Goonies, The Gate, Poltergeist, Gremlins, and The Burbs, Under the Bed fits in with all of them, defying any belief that it was finished in 2012 in the process. That great layer of 80’s creepiness and adventure which transformed everyday homes and suburbs into fantastical adventures is definitely present in Under the Bed. Add to this the Goonies-style sign on Paulie’s room, a really fun and nostalgic bike-riding scene with the brothers, Neal’s mysterious sketchbook, and a whole bunch of other cool stuff that was found in the 80’s movies that Under the Bed is paying homage to. Unfortunately the movie also has it’s fair share of problems. Under the bed has a few problems with the script, the performances, and the direction. To begin, the script is a little slow for the first hour. The direction of the story was clear enough, but it could have been kicked into a higher gear a bit sooner. Also, as Neal and Paulie battle the evil force in their home they seem to come up with some rules to stay safe, but they almost never take these rules into consideration (‘don’t move’ and ‘don’t make a sound’). It may not seem like a big deal, but it certainly breaks the spell for the viewer at times. Also, a scary scene early on with Angela seemingly has no logical consequences for her and the family which is a really hard pill to swallow that early on. The character and performance of the dad was way over the top. I think the filmmakers were going for a strict dad, falling apart at the seams, but who still loves his kids. Unfortunately he comes across as easy to hate and a terrible father. In my mind he was not even in the vicinity of being a ‘good guy’ throughout the story. Finally, in a few scenes that involved a scare or a sinister conclusion it was sometimes difficult to decipher what was supposed to be scary or sinister. The most obvious example is again the scene with Angela in which the ‘scare’ seems to be that her laundry basket has beened moved. I can assure you that the scene with Angela is actually a pretty good one, with some great build-up, but to have it end on something as dull as a moving laundry basket is a shame and kind of ruins what the rest of the creepy scene. Despite the problems in Under the Bed, the last half-hour is extremely solid and worth the price of admission alone. The filmmakers utilized the best part of 80’s filmmaking which is the practical special effects and in Under the Bed we get some incredible creature effects. It’s really perplexing why more horror filmmakers don’t make the decision to use practical effects. When used properly, as in Under the Bed, it’s hard to find a better reason to love horror movies. Also, Miller and company have ratcheted up the gore found in 80’s horror movies, and as a result Under the Bed becomes more than just an homage, taking on an identity of its own. Far from perfect, but with many more positive than negative qualities. If you’re looking for a scary night out at the movies then give Under the Bed a shot. If you’re like me and love 80’s horror movies then Under the bed is absolutely not to be missed.